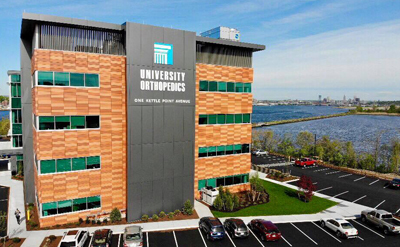 One of the key features that differentiates us from other Rhode Island centers that treat back pain, including low back pain and sciatica, and neck pain is the spine-specialized therapy department at the University Orthopedics Spine Center. In many unspecialized clinics, a physician will see the patient, perform an examination, and then refer the back pain sufferer to a physical therapy clinic all the way across town. This general "evaluate & treat" prescription for physical therapy is all too common. Often, a general physical therapist will start from scratch by forming their own evaluation and assessment, without the benefit of knowing what the original physician found out through diagnostic tests. This general physical therapist often sees a wide variety of problems every day, such as patients with sore elbows, sore knees, and sore shoulders. In most cases, this general therapist has a very limited understanding of how to treat specific types of back problems. At best, a general physical therapist has taken a couple courses on how to perform therapy for a back or neck injury. A general physical therapist may also rely too heavily on passive "modalities," such as ice, heat or ultrasound, to treat back pain. This may not be a good choice, as research has shown that using these passive treatments is NOT the best way to return someone to activity efficiently. Instead of sending a patient across town, they will be able to come directly into our rehab department. They will also be connected with a specialized physical therapist who has advanced training in spine therapy. Rather than starting from scratch, this therapist works off of information gleaned from the previous physician's evaluation, picking up where they left off. Instead of receiving a general treatment approach, your therapist is specialized in the treatment of back and neck pain. Our therapists have advanced, hands-on skills that can help relieve your pain and get your injured muscles, tissues and spinal structures moving again. Instead of a single school of thought, you get the benefit of being treated by a specialist with a variety of skills who can choose the ones that best match your particular problem.